USB power banks are a convenient way of powering low power USB devices in the field. Unfortunately, as they are designed for charging phones and tablets, many have an internal electronic cut out circuit that switches power off below a certain current draw. The exact current that they switch off at varies from pack to pack. Although there are circuits on the internet that purport to solve this problem by applying a pulsed load, we found this did not work with all power banks. As a result we designed a neat variable electronic load to address this problem. Available as a kit, using it is easy; just plug it into your power bank, plug your target device into it and adjust the current draw until the pack remains on. This could be a handy tool for those of us who use USB battery packs for portable work. SotaBeams originally created this simple kit for the WSPRlite. 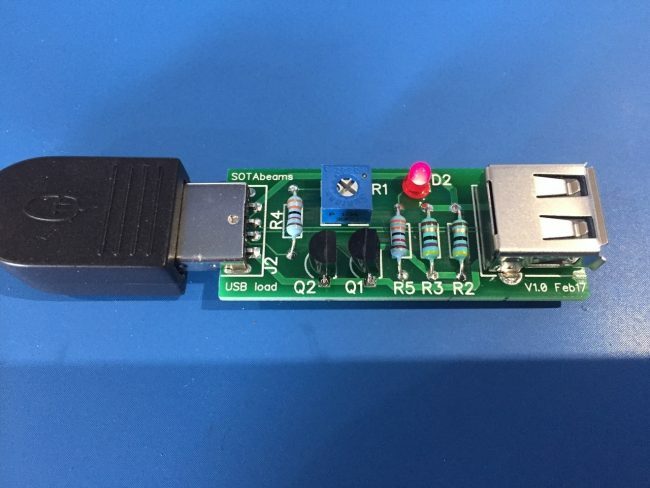 This entry was posted in Kits, New Products, News and tagged Kits, SotaBeams, USB, USB power on March 22, 2017 by Thomas.